Marshal Ney, ('The bravest of the brave', Prince of Moscow, Le Rougeaud) was a singularly unlucky man. In 1813, he had the chance to fall upon the Allied rear at Bautzen. If he had, history might have been changed. In 1815 he was again responsible for letting an Allied army, the Prussians, off the hook at Ligny. He was also the only Marshal to be shot for treason for joining Napoleon in 1815. Ney ordered d'Erlon's corps back to Quatre Bras just as it was about to fall on the wavering Prussian right flank at Ligny. If d'Erlon was able to attack the Prussians, it may have sent their army fleeing. Instead, the Prussians were able to retreat in a more orderly fashion. Napoleon blamed Ney and the newly created Marshal Grouchy for his loss at Waterloo, and so have many historians. This book follows Marshal Grouchy through the battle of Ligny under Napoleon's watchful eye, and the battle of Wavre where he was left to his own devices. The reason I mention Ney is that his blunder had a tremendous effect on Grouchy's subsequent orders and mission. Napoleon's 1815 campaign was full of what ifs. He was able to drive a wedge between the the Anglo-Allied army and the Prussian one. Then he defeated the Prussians at Ligny on June 16th 1815, only to lose at Waterloo on June 18th. Napoleon's defeat at Waterloo was mainly caused by the Prussians being beaten at Ligny, but not routed. This is where the part of Grouchy in this history becomes so important. Grouchy was ordered to follow the Prussians and keep his sword in their back. This is the third in the series. The author gives us an excellent account of the two battles of Ligny and Wavre. If that was all a book on the subject had to do, it would probably would have been a much easier task for the author. Unfortunately for him, this campaign has been written about probably more than any other campaign in history. The arguments over this campaign and its battles and personalities have raged over the last two hundred years. The list of should, could, and would haves are almost endless. As mentioned, Ney and Grouchy are the favorite punching bags of historians and armchair generals. As the author shows, the questions about Grouchy start even before the campaign in Belgium began. Many, even at the time, questioned Grouchy's elevation to the Marshalate. We have, or at least we believe we have, all of Napoleon's orders to Grouchy. The book clearly shows them and what it entailed because of them. The author shows that Grouchy did exactly as he was told per his orders, nothing more or less. The point of conjecture here is what Napoleon ordered compared to what Soult, his then chief of staff, sent. Soult, although a fine general, was no Berthier. Why do accounts show Napoleon expecting Grouchy to show up on his right? Why did so many French officers on the right believe they were there to make contact with Grouchy? Was it all just wishful thinking? 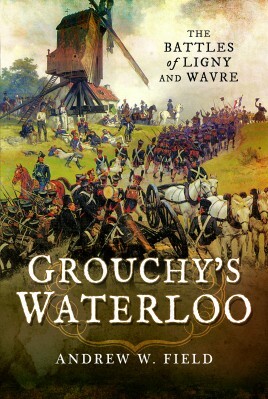 To me, the most telling part of what was expected of Grouchy is in the absence of a negative response from Napoleon, chastising Grouchy when troops showed up on his right at Waterloo. In the beginning, no one could tell if they were Prussians or French soldiers. As the author shows, the 'Grande Armee' of 1815 had nowhere near the mettle of the armies during the year1805 and others. Its morale was actually brittle. Mr. Field contends that you cannot judge the orders and actions of officers of the 19th century with 21st century thinking. He asserts that in 1815 there was no leeway in orders. I am not wholly convinced by his arguments that this was unilaterally true. Napoleon's and Jomini's writings suggest otherwise to me. However, this might me be their own Monday morning quarterbacking. It is quite possible that Napoleon's undoing was his inability to clone himself when armies and battles grew larger. This book, when taken by itself, is a great addition to the history of the campaign. When looked at in conjunction as the third volume of four on the campaign, these books are a treasure trove of information from the French perspective. I for one believe the 1815 campaign was decided, along with Napoleon's fate, when Marshal Berthier refused to rejoin Napoleon. If Marshal Berthier was chief of staff most, if not all, of the errors on the French side would never have been committed.